Michelle Rhee tirelessly pushes her group, Students First. We care. Teachers don't. Apparently, though, while they try to appear neutral on the whole abolishing collective bargaining and firing teachers without just cause thing, they privately push it. In fact, this piece says they actually write the laws that hurt teachers. In the United States, oil companies write energy legislation, pharmacy companies write Medicare reform. 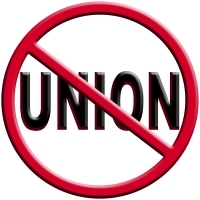 Teachers, being unionized, can't write education laws, so those who'd break their unions do. Barack Obama said he'd get a pair of comfortable shoes and walk with unions when they were under attack. Oddly, in the presidential debates, he called Rhee a great gal or something. If the President actually cares about working people, here's the perfect opportunity for him to reconsider. He can find those shoes, or continue to support demagogues like Rhee who work full-time trying to hurt working people, the people the students they claim to care so much about will grow up and become.